Welcome to Poppet and Wildflower. 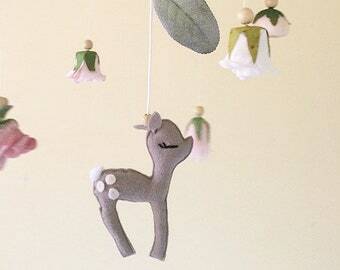 Whimsical nursery & children’s room decor that evokes the imagination, a love of nature and inspires a magical heart. Each piece is lovingly handmade in Australia with love and great attention to detail. 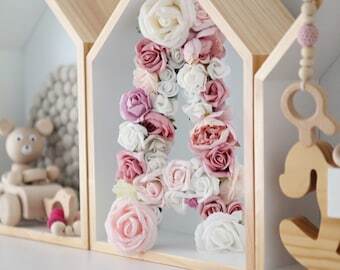 We hope your Poppet & Wildflower design becomes a family heirloom for generations to come. Please feel free to message if you'd like a slight variation for any item and I'll do my best to accommodate. We will open once per month with all designs ready to ship. Your order will be sent within 4 business days and a shipping tracking number will be sent via Etsy once your order is on its way. Please allow approximately 3-8 business days within Australia and approximately 10-15 business days world wide. Shipping times can vary depending on your country however you will be sent a tracking number when your order is on its way. We only ship with tracking so you can keep and eye on your parcel in transit. Thank you and please don't hesitate to send me a message if you have any questions. Please note- Some countries may charge an import tax or VAT. Please check your country's policy before ordering as we are not responsible for any customs charges that may occur. USA does not charge any import taxes at present. All designs and concepts are Copyright protected 2018. 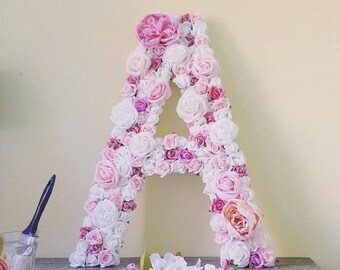 Floral Letter - Personalised flower letter- Floral name- Floral Decor- Cake table wedding decor- Christening decor gift- LARGE 38cm/15"
Our beautiful large swans look majestic under a canopy! Poppet and Wildflower is a collection of beautiful and whimsical pieces which are feminine, delicate and capture the meaning of what magic and whimsy means to me. 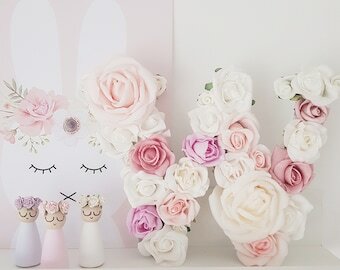 We are handmade and each piece is lovingly handmade by me. Each item starts as a well thought out idea. Then it is sketched in my diary, I then select fabrics, trims and flowers and I get to work constructing. I use the highest quality materials and only those that invoke the feeling of magic for me. Every piece is lovingly constructed in my studio in the beautiful rain forest of Tamborine Mountain, Australia. Do you sell music boxes? I don't stock music boxes unfortunately. 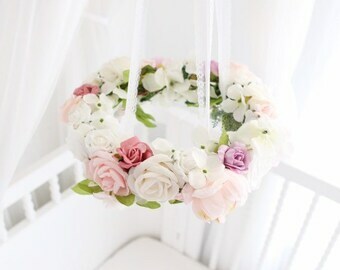 Please send me a message to discuss the possibility of wholesale sales. All of our packages come beautifully wrapped. If you'd like a personalised note to your gift recipient, please mention so in the "notes to seller" area at checkout. Please send me a message to discuss what your idea and I'll try my best to accommodate your request. Can I combine shipping if I buy more than one item? Shipping can be combined provided your parcel is under 500g. If over 500g the price will be in the next postage bracket. Please contact me for an estimate. All shipping overages are refunded. Can I have a white timber frame instead of natural timber? Yes, absolutley! A white painted frame will incur a service fee of $9.95 AUD. Please send me a message before ordering. Can I buy a single unicorn or swan without the mobile? 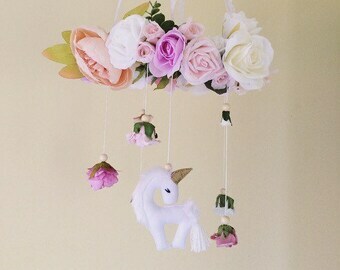 Unfortunately I only sell unicorns as a part of our floral unicorn mobile. 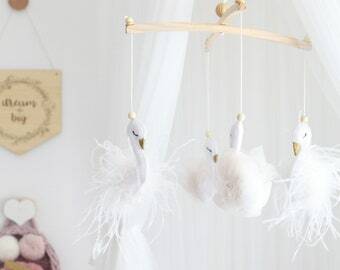 Larger hanging swans are listed under our swan section. How do I hang my mobile? Alternatively you may find attachment arms for sale elsewhere online. 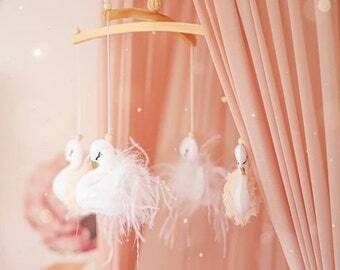 Our floral mobiles hang from lace with a small metal ring. 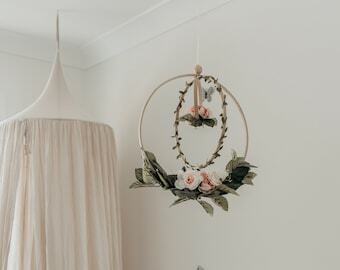 To adjust the height of where you want the mobile to hang you can tie a piece of strong string between the loop of the mobile or the metal ring and to the hook. Please make sure it is out of reach from little hands.